Law enforcement officials from across the Bay Area and beyond - including California Attorney General Kamala Harris - will be in San Jose on Tuesday to pay their respects and offer a final salute to fallen San Jose police Officer Michael Katherman. 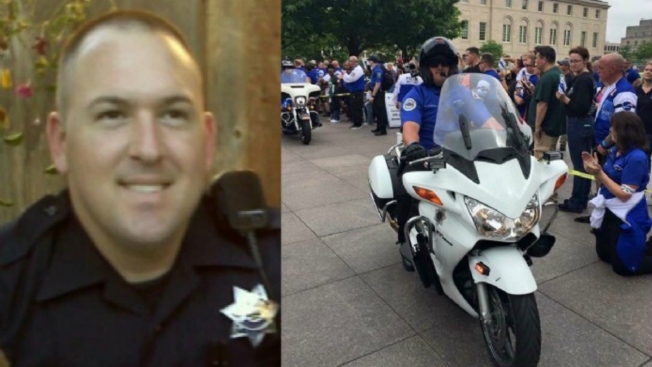 The memorial service for the motorcycle officer killed in the line of duty last week will begin at 11 a.m. at SAP Center and is open to the public. There will be a private burial in Gilroy later Tuesday, according to the San Jose Police Department. Katherman, 34, an 11-year veteran of the force, died June 14 after a minivan collided with his motorcycle on 10th Street in San Jose. He leaves behind a wife and two young sons. "Our officers are out there on the front lines taking extremely dangerous risks for us every day to keep our community safe and to serve us," said San Jose Mayor Sam Liccardo. "We need to honor them when they spend their final moments in that service." Before the service, starting at about 9:45 a.m., there will be a large police procession escorting Katherman's body from the funeral home in Los Gatos to downtown San Jose. The procession route will follow Santa Cruz Avenue out of Los Gatos until it becomes Winchester Boulevard. From Winchester, it will turn right onto Stevens Creek Boulevard, which becomes San Carlos Street. From San Carlos, the procession will turn left onto Montgomery Street, which becomes Autumn Street just south of the arena. The procession is scheduled to arrive at SAP Center at about 10:30 a.m.
Because of the procession and other traffic congestion, San Jose police are encouraging the public to use public transportation. Standard security procedures will be in place at the arena - all bags and purses of those entering SAP Center will be checked by arena staff. The service will feature a walk-in by SJPD officers and a flyover conducted by the department's Air Support unit. The service is expected to last about two-and-a-half hours and will be followed by another procession from SAP Center to the Gavilan Hills Memorial Park in Gilroy. The police department said that during the service there will be a fully staffed law enforcement presence throughout the city, including San Jose officers answering calls, with support from the California Highway Patrol, the Santa Clara County Sheriff's Office and other agencies from across the county. The San Jose Police Officers Association has planned an all-day fundraiser at Famous Dave's BBQ on Curtner Avenue in San Jose, with proceeds going to the Katherman family trust fund. Those wishing to make donations should contact Joanne Segovia with the San Jose Police Officers Association at joanne@sjpoa.com.